Spring has finally arrived with calmer winds and numerous kayak fishing opportunities in tow. The Sea Trout bite will be red hot in the entire region. The most productive kayakers will cast large top water lures on mullet-covered flats. Be on the water at first light or at dusk, and be extremely quiet. Lagoon Sea Trout don’t reach gator size by investigating odd noises. Wading may be necessary if winds don’t allow for a silent approach that is needed to catch the trophy trout. Just about any top water plug from walk-the-dog types to poppers will get you strikes. Best colors for these lures are chartreuse, sea trout, red head with a white body, and natural. On the conservation tip, please release all big Sea Trout; they make more! Plus, there are plenty of 18-20 inchers if you are looking for dinner. For the adventurous paddlers, Cobia and Tripletail should be available off the beaches of our region. As I write this (mid-March), the main body of Cobia-friendly water (68°-72°) is hanging from Patrick Air Force Base, south. Through April, the Cobia and the Manta Rays they follow will move north. By the time this publication hits the stands, I would expect kayak anglers may find Cobia from the Cocoa Beach Pier, north to Playalinda Beach. Canaveral National Seashore (Playalinda) beach access can be tricky to navigate with kayaks due to their “ziggy-zaggy” nature, but the deep water and structure will wipe that from your memory. Medium/heavy tackle from 12-20 lbs., with leaders in the 40-60 lb. class, will subdue even monster Cobia. I personally prefer 10 lb. river tackle on the average sized (15-20 lbs.) Cobia most encountered. Though any live bait will peak the cobias interest there is no need for the hassle. Large bright jigs of which Handler tackle supply in Port Canaveral has many of will work well. Remember to size the jig for your tackle not the fish; all will have heavy enough hooks. One of my little tricks is to bring a dozen or two jumbo shrimp and some ¼ to ½ oz. jig heads not only do cobia love them, but they are a sure bet if a tripletail is spotted. When searching for cobia look for floating debris, dense bait pods, turtles, manta rays, and free swimming fish. Be sure to have a good pair of polarized sunglasses to see the brown shark looking fish. Please use common sense when dealing with large fish in open water. VHF radios, visibility flags, and the buddy system are safety precautions that should be taken. A fish-bag works great to ice down your days catch of cobia and tripletail, and be sure to check your regulations. If all that sounds like a little too much work, but you still want a kayak cobia. Give me a shout and book a Mothership kayak fishing adventure, huge fish none of the hassle. For some awesome pictures of the space costs most prized game fish visit and “like” Facebook/Local Lines Guide Service the official space coast fishing page. Triple-tail are a common catch on Mother-ship kayak adventures into the Atlantic from Port Canaveral, Florida. 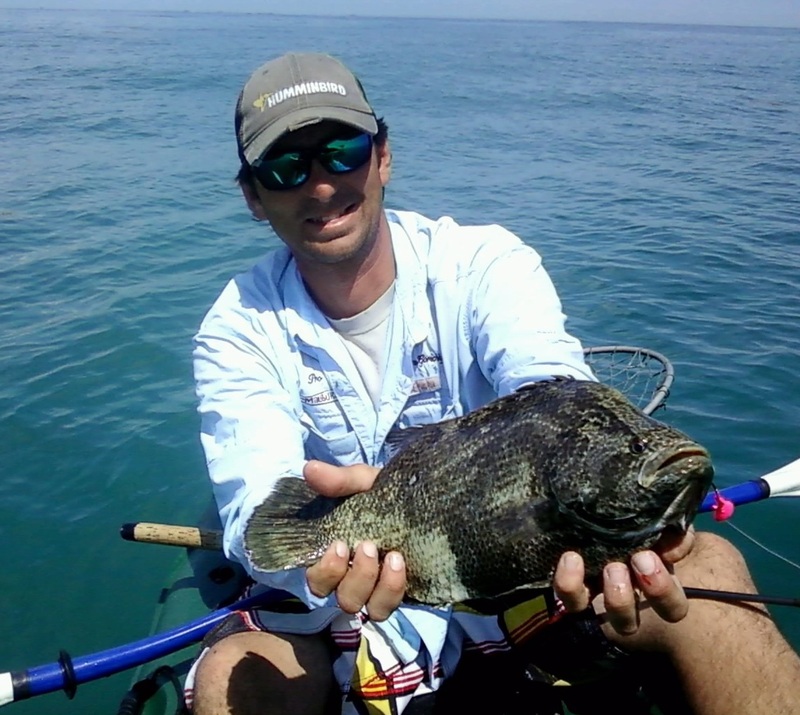 Kayak fishing the Coastal waters of Cocoa Beach for huge and interesting fish with motorized support. Gotta love the hard fighting good to eat Tripletail. Port Canaveral, Fl has some of the biggest in the world. Capt. Alex of http://locallinescharters.com/ can put you on them. How about some redfish inshore from my Malibu Kayaks. Kayak fishing is a blast and I have all the equipment for a great trip. This Redfish was caught from Cocoa Beach, Fl in the Banana River Lagoon. Spring Time fishing is hot! Book Now! Don't forget the heavy Cobia that swim in the surf line of Cocoa Beach, Fl. A short run from Port Canaveral's adjacent to Grills Seafood & Tiki Bar a popular location. Have them cook your catch while you sip a few cold drinks. April in my mind is ripe with angling opportunities. Of course our homebody trout, reds will be available, but we also will get shots at cobia and tripletail for the more adventuresome paddlers. The trout spawn will jump off this month, but please let’s give them a break until the impact of the freezes on breeders is known. Many nice reds will fall for search baits such as Saltwater Assassin paddle tails weedless or on a jig head and mirro-lure suspending lures in natural colors on the vast flats of the both Lagoons. Clean water and baits of all sizes should be present-if not find a new flat. For trout (catch, photo, release), break out those topwater plugs like the Mirror-lure line of baits, Badonk-a-donk, Skitter-Walk, and Zara-Spook. Hit the water at dawn or dusk. This month could be your last to target blackdrum in the NMZ. Schools of these drum will be in tightening as they move off the flats. Hit the outer bars, and sight fish while standing on a stable kayak like the Malibu Kayaks Stealth 14, while they rest, and if the tails are waving you can’t miss them. The best baits are a quartered blue crab, or Gulp shrimp and crabs fished still on 3/0-5/0 circle hooks. For reds try the flats in 1-2ft. with many pot-holes. Use a Saltwater Assassin paddle tail weedless, or Mirro-lure suspending lure to locate reds holding in these sand spots. Then slow way down and put multiple cut mullet or ladyfish in each of these “holes”. Let them sit for five to ten minutes then drift to the farthest pot-hole you hit, and repeat the process. As the water on the beaches hits the 68 degree mark cobia will become available. The Cobia can be reached utilizing the many public beaches of Brevard County. Do your dock work and seek out info on fish close to the beach, then grab a buddy and go! Look for wing tips of Manta Rays, debris, birds and bait. Some bright bucktail jigs from Handler Fishing Supply, a medium/heavy spinning rod, a drift sock, and you’re in business. 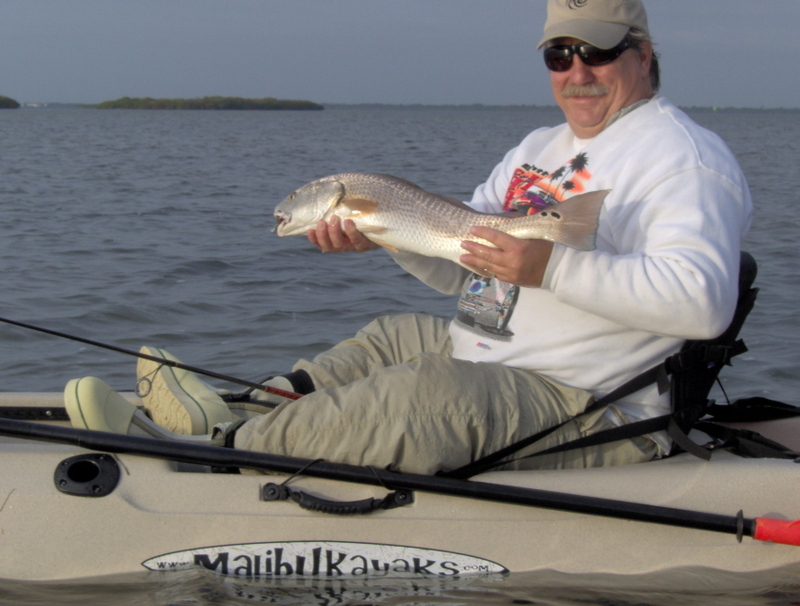 Kayak Fishing guide on the space coast.